Some interesting finds from a box of vinyl stowed between kitchenware and 1990s jumpers in a second hand outlet. Because of limited time for browsing I just grabbed seven items and now I’m pretty happy with the outcome. Really no techno but the first one, “Supertrax Vol. 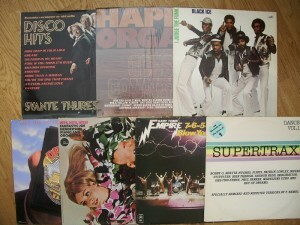 1” from 1983, features many highlights of the italo/hi-NRG and electro scene. Taking off with Bobby Orlando and his curated projects like One-Two-Three and The Flirts, we proceed to Patrick Cowley, Paul Parker, Man Parrish, Sylvester and others. Including Maurizio Vandelli AKA Key Of Dreams performing “Africa”, a song known from Toto’s catalog. Liner notes tell the record contains specially remixed and re-edited versions by F. Ramel, but all tracks sound pretty solid. Performing in 1966 with Lill Lindfors, Svante Thuresson was the runner-up of the Eurovision Song Contest. In 1978 he published “Svenska Versioner Av Aktuella Disco Hits”, a compilation of international disco songs like Bee Gees’ “How Deep Is Your Love”, “More Than A Woman” and others sung in Swedish, in total ten tunes with a jazz and easy listening touch. 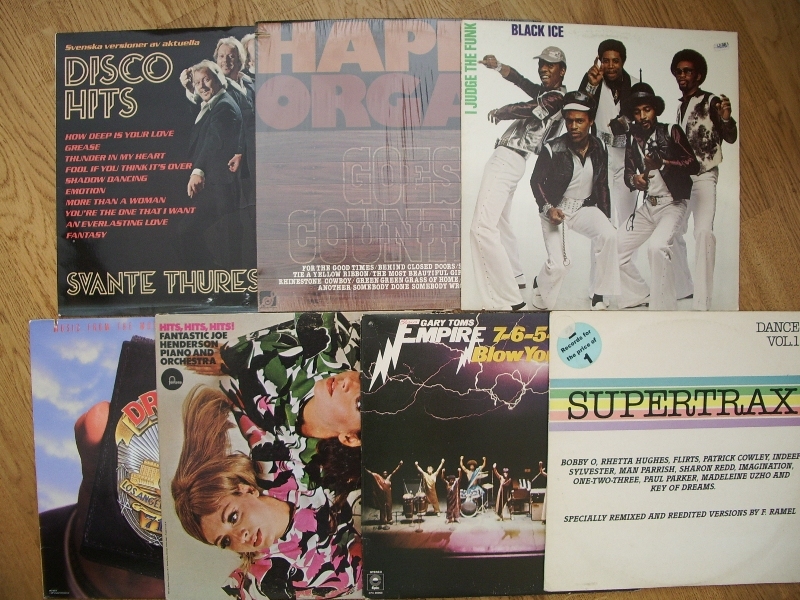 More disco funk in “7-6-5-4-3-2-1 (Blow Your Whistle)” by Gary Toms Empire and “I Judge The Funk” by Black Ice, the guys from 1979 looking as genuine as their music. Art of Noise was one of the contributors to the soundtrack of “Dragnet”, still a rather unspectacular reflection of pop tunes from 1987. Easy listening album “Hits, Hits, Hits!” by Fantastic Joe Henderson Piano and Orchestra landed in the basket because of classy ladies on the sleeve and for the end, Happy Organ‘s “Goes Country” has a taste of adventure for any sworn electronic music man.